Welcome to the Grid Works - Content Cooperative Class Series. Today we're going to work on creating a simple T-shirt. For those interested in only using the PNG files, we will cover that in the second half of the class. Please start your graphics program and open the file in either PSD, Gimp, or Paintshop Pro format depending on your program. You should have several layers set up. The top one says "Keep Off." This is a template file created by Robin Wood. If you turn it on, it helps to show you how the shirt will fit onto your avatar. But if you save the file with it on, the template will show up. So unless you are using it to position a graphic, it is best to leave it off. The next 4 layers are the front and back collars and the two arm bands. If you click on the layers, you will see I have them set as an Overlay and have reduced the opacity. This helps blend them into the shirt. Finally we get down to the area where we will color our shirt or add other graphics. I had to set this up differently between Gimp and Paint Shop Pro. First, for those of you using Gimp, you actually have two layers. The bottom one is the base layer and doesn't need to be edited. The second one from the bottom currently has a color filling the area and it is set as "hard light." In order to change the color/texture of your shirt, make sure you have clicked on that layer. Then change it from "hard light" back to "normal." This is done at the top of the layer window. Then go to "Select" and "All" and then hit delete. The color should have been removed from your image. To fill it with a new color, click the little paint can on the toolbox. Then at the bottom click either the FG or BG or Pattern Fill. If you are filling with a color, click either the top color box for FG or the bottom one for BG. If you are filling with a pattern, choose the pattern. To fill, again make sure you have selected the second layer from the bottom and then click the image with your cursor which should look like a little paint can. Also make sure your opacity is at 100% in your toolbox window. When you first fill on this layer, you will not see the base layer like you did when you first opened the file. This is because we changed the layer type to "normal." So to get the base to show through, now change the layer we filled to "Hard light." Now it will look similar. You can also play around with the settings and other layer types before finishing. You can also import special graphics like logos or add text on this layer. When you are done, you can save the file in XCF format if you want to edit this file in the future. To use the file in Opensim, save it as PNG. Before doing so, you should resize the image using Scale to a 512 x 512 pixel image. This helps reduce load in the grid. Now the process is similar for those of you using Paint Shop Pro. The bottom layer in Paint Shop Pro is actually a group of layers consisting of a base, a color layer, and a mask. Right now, there is a color in the middle layer of this group. Make sure you click this layer. You will notice, the color layer has a setting of "hard light." To change the color, you do not have to change the layer type in this program. Just got to "Select" then "all" then delete. Your color will disappear. To pick a new color, make sure you have your paint can selected. Then click in the top color box on the materials window. A material properties window will pop up where you can select the color you want. You can also check the texture box and apply a texture at the same time. Once you have your color selected, check to make sure you still have the middle layer selected in the group. Click on the image with your cursor which now looks like a paint can. Your color should now fill your image. You can also add other graphics or texts either on this layer or you can add layers as long as they lie between the mask layer and the base layer. You can turn on the template temporily as you add graphics or text to help in their placement. Like those using Gimp, you can save this in the native format of Paint Shop Pro if you want to edit it in the future. Then you can save it again as a PNG to upload to OpenSim. You should resize the image using Scale to a 512 x 512 pixel image. So now we actually get to the point of uploading to OpenSim and making our shirts. Depending on your viewer, you need to find the upload command. Upload an image and browse to where you saved the t-shirt in PNG format. Click the file and wait for the upload window to show up. When the image box shows up, change the "Preview image as:" to "Female Upper Body" or "Male Upper Body." The hit "Upload (free)." Your image should then upload and show up in a texture window. Now, to make the shirt with this, open your inventory and go to the folder where you want to save your shirt. Right click on the folder name and hover over "New Clothes" until the flyout window shows up and choose "New Shirt" from that menu. Find the new shirt in your folder and double click it to wear it. Your avatar should now have a white shirt on. To edit your new shirt, go into Appearance mode. In the appearance window, click the "Shirt" button. 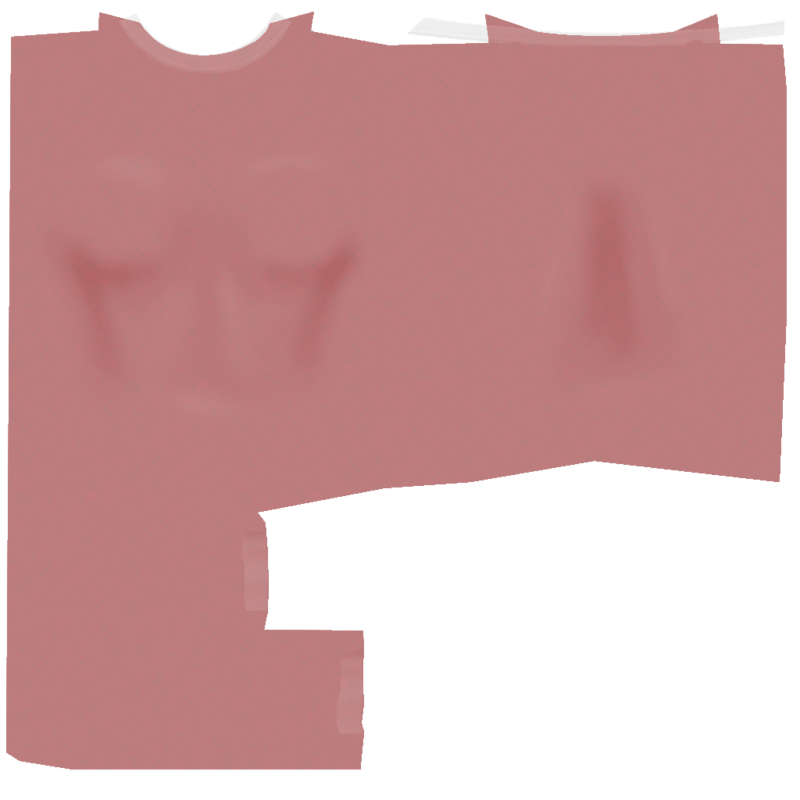 To get your custom texture onto your new shirt, you can drag it from the texture window to the upper white box called "Fabric." Or click the white box called "Fabric" and browse through your textures to find your uploaded shirt image. You can also tint your shirt by clicking the bottom white box called "Color/Tint." Now, your shirt should look like the one we created. Because I noticed some minor imperfections around the neck and at the sleeves, I chose to edit these areas using the sliders in the appearance window. When you are happy with your shirt, click "Save As..." and rename your shirt. And hit "OK." You now have a new shirt! Thanks so much for coming to our class! This content is released through a Creative Commons Attribution-NonCommercial 3.0 Unported License.